Any fashion-savvy person will tell you that looking effortless actually takes a lot of energy. Calle Evans’ photo shoot, captured in the bright and airy People’s Liberty space, felt as effortlessly chic as Calle’s own designs. Calle Evans is a fashion designer in the classical sense. She designs, sews, hand-beads and custom-fits each piece for each person, one by one. If she’s not doing every step, she’s hiring a skilled friend to help. Every piece is made in Ohio, and the garments never lose their bespoke quality. Calle’s crew started with two colleagues and friends: Tessa Clark, a fellow designer and Calle’s oft-used stylist; and Coryn Bostwick, a client of Calle’s and her business partner in a new venture called The Art of Elegance. 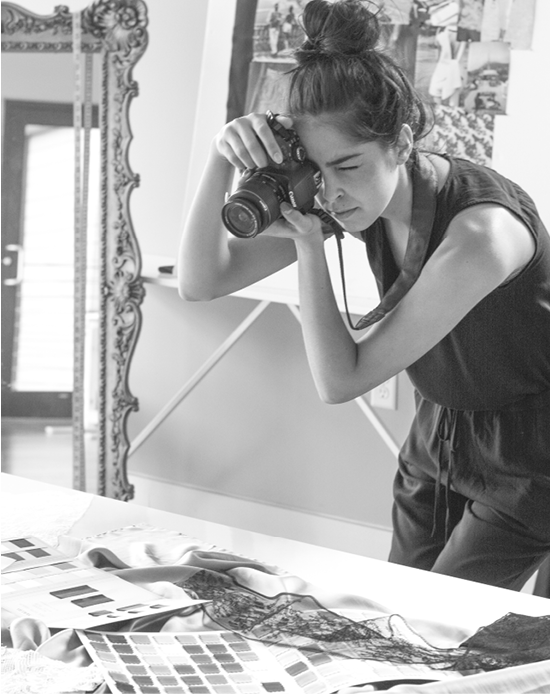 Tessa recommended Andrea Sabugo, a photographer with experience in fashion design, for the team. Calle and Andrea instantly clicked, and what followed was a flurry of emails, Instagram messages, and one-off conversations about inspiration photos, mood boards, and designers. Their shared vision culminated in an airy, light-filled photo shoot showing the almost ethereal practice of bringing a garment to life. It wasn’t hard to make Calle and model Emma Karle look beautiful on camera, but Calle had a specific concept in mind. She connected with two creatives who executed it perfectly: hair stylist Tara Tussing Wood created owing, sleek locks, while makeup artist Laura Vega brought out the angelic-with-a- side-of-sultry look. Good vibes don’t make themselves. Establishing a team with similar tastes, a natural ease, and plenty of open communication made the collaboration feel just as effortless as the photos.